The Smartwatch is an ultimate accessory of smartphones. It makes it easy to always stay connected with your smartphone. Interestingly, smartwatches have evolved from traditional wearable to a more suitable device for this century. Smartwatches with integrated technology such as waterproofing from the likes of Apple, Google, Fitbit, and Samsung are now available. However, choosing the best waterproof Smartwatch can be overwhelming. If you are someone with active lifestyles and want the best waterproof Smartwatch our product reviews and buying guide will help you make a smart choice. Read on! Compatibility with your smartphone – Make sure you check a Smartwatch before going for it because not every Smartwatch are compatible with every handset. Ensure your smartphone is compatible with the device. The operating system of your smartphone will dictate the one you should go for. Water resistance rate – The rate of water resistance varies from one waterproof Smartwatch to the other. Water resistance rate can range from 30 meters to 300 meters. If you will not be swimming or taking shower with your watch you can go for water resistant Smartwatch of 30 meters. But if you will like to dive, swim and take a shower with your watch a waterproof of 50 meters and above is the perfect option. Touchscreen – Some smartwatches have rotating bezels or side buttons to navigate around while most have touchscreens which allow you to operate like your mobile phone. Regardless, the performance of your Smartwatch would not be affected. But the ease of use could be impacted. Touchscreen device makes it easier to navigate, and input numbers or text. Battery life – Everyone wants a device with long-lasting battery life so it can serve for long. The model of a Smartwatch would determine how long it lasts. Most of the smartwatches available on the market use a rechargeable battery. Note that, the battery of a device with advanced sensors and large screens tend to run out quite faster than one with small screens and fewer features. Fitness features – Some smartwatches has exercise-logging features are trackers for fitness while some have advanced features. For the best waterproof Smartwatch you can check for heart rate sensors, workout activity, duration, and distance, sleep monitor, swim-tracking with IP×8 waterproof recommended, GPS tracking, calories burned and much more. Connectivity – Most of the available smartwatches has Bluetooth, Wi-Fi, and 3G connectivity. The latest connectivity from the world of smartwatches is 4G or LTE. This would allow you to text, call, and perform other tasks without your phone around. However, it is only available to a few smartphones at the moment. Appearance – You need to balance functionality with the look and feel. Some smartwatches look like a traditional watch while some have an ultra-tech look. Whatever your choice is, ensure you pick the one that looks nice on your wrist. Price – Note that the cost of a waterproof Smartwatch does not indicate its performance. However, you would be paying for advanced features by spending a little more. Some of the advanced features can be colored screen, designer decoration and brands, and premium materials. Other features you can consider are voice commands option, customization, and support for media playback. There is a difference between water resistant and waterproof Smartwatch. A water-resistant Smartwatch will probably survive a light rain shower or if water splashes on it when you wash your hand. Also, it might be okay if you wear it in the shower accidentally but the chance of it surviving while you swim is very slim. On the other hand, waterproof Smartwatch should be able to handle any wet environment such as swimming and getting wet in the shower. However, the level of waterproofing varies from one device to the other. When deciding on the best waterproof Smartwatch to go for, it is essential to know the degree of waterproofing the device has. 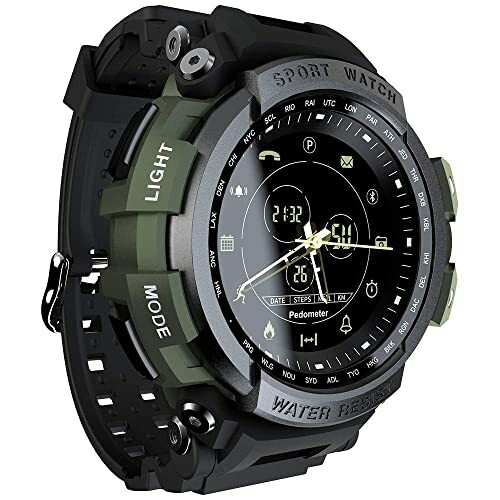 With the features the LOKMAT Sports Waterproof Smart Watch displays, it is one of the best waterproof Smartwatch available on the market. The product features 1pcs CR2430 lithium battery that is built in it and provides 290mAh high capacity. With the battery, the watch can work for a year and two months. However, under energy saving mode it can the battery life can be extended to two years and nine months. Its waterproof rating is 50meters (5ATM). This means you can take a bath, wash hands, and swim while putting it on. Included is a Bluetooth 4.0 that allows you to connect with your iOS or Android device when you download the app on your phone. 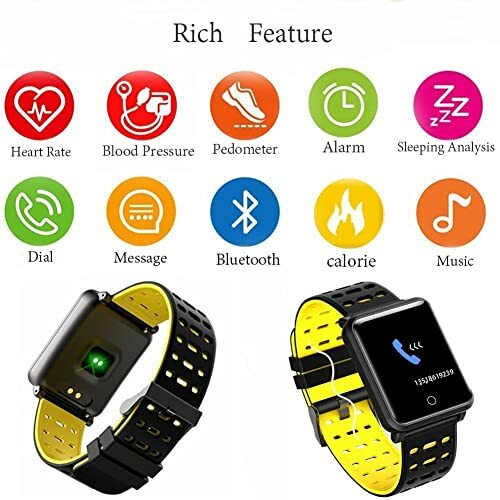 The multifunction Bluetooth waterproof Smartwatch has luminous dial, records and display walking distance, burned calories, and walking steps. Also, it features a remote camera that provides you with the opportunity of taking photos anywhere you go. Adding to its features is the call and message icon that makes a notification sound and keeps flicking when you have a call or message either text or social media messages. Furthermore, the waterproof Smartwatch has precision laminating process, metal surface, and Nano TPE material watch strap that is anti-sweat. This product features an upgraded IP68 deep waterproof. I love this feature because it allows you to wear the watch while sweating, swimming, and washing your hands. You can also dive with it. The Smartwatch has a Bluetooth that allows you to connect with your smartphone. It ensures that you don’t miss a calls, SMS and social media messages. Included is also an activity tracker that provides information about the calories burned, the number of steps you have taken and how far you have gone. Adding to its features is the sensor that monitors, record and calculates blood oxygen, blood pressure, and heart rate. It can also track your sleep quality, duration and record deep light sleep. You can check the tendency of your sleep through the app and work on I proving your sleep quality. Another interesting feature the product has is dustproof that allows you to wear it in a dusty or rough condition. The screen of the Smartwatch is 1.3″ IPS LCD full HD touchscreen. It ensures that you see the display clearly no matter the condition of use. The screen displays caller id and caller name. A strap that is breathable, ultra-soft, and fit for different wrist sizes is included. It features a battery having a capacity of 180mAh with about 2 hours of charging time. The Smartwatch features 50 meters waterproof that ensures you comfortably use it to swim, shower, hit the beach, and also wear it while washing your hands. More than 15 exercise modes are included. This feature allows you to get real-time stats while doing exercise. You can connect with the GPS of your smartphone to get real-time distance and pace that is more precise. It has a sensor that tracks your sleep stages, heart rate and everyday activities. The product also features a battery that can last for more than four days even though this might vary with use. Added to its features is storage that allows you to store more than 300 songs. It means your favorite music can always go where you go. The Smartwatch has personalized on-screen coaching that direct you through each move. It features menus that give you access to weather, calendar, sports, text and some other apps. 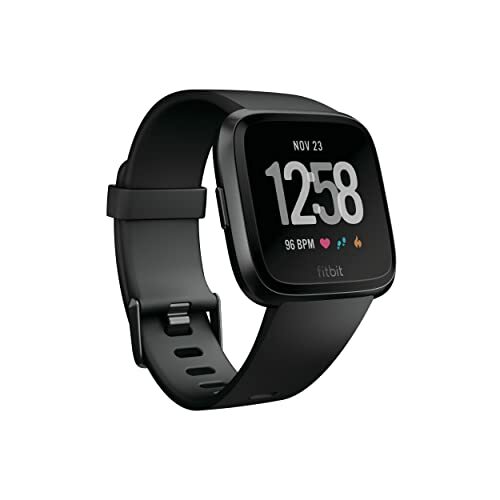 Furthermore, the Fitbit Versa Waterproof SmartWatch has a built-in NFC chip that allows you to make secure payments. It features clock faces for all occasions.